BSNL Broadband service has announced new Broadband plans exclusively for Ahemdabad and Vododara Customers as promotional offer basis for a period of 90 days. 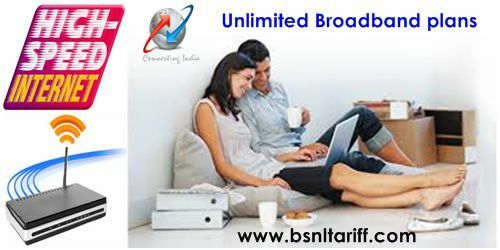 Most Trusted Telecom brand Bharat Sanchar Nigam Limited (BSNL) introduces new 4Mbps speed Broadband plans with higher FUP (Fair Usage Policy) limits for a period of 90 days as Promotional offer basis from 15th February, 2016 onwards in Ahemdabad and Vododara of Gujart Telecom Circle under Broadband Services. 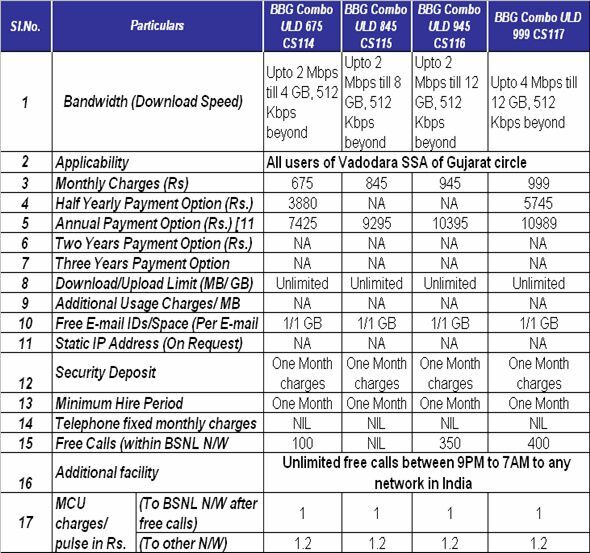 BSNL new Broadband plans BBG Combo ULD 675 CS114, BBG Combo ULD 845 CS115, BBG Combo ULD 945 CS116, BBG Combo ULD 999 CS117 comes with a higher FUP (Fair Usage Policy) limit as well as increased post FUP download speeds compared to existing broadband plans. In addition BSNL has also introduced new Broadband plan Combo ULD 899 CS119 offers 1Mbps speed without any FUP limit available exclusively for Ahemdabad customers. Broadband plans launched in only those locations/areas of Vadodara and Ahmedabad of Gujarat Telecom Circle where there is a matching competition from Private Telecom Companies. BSNL offers additional facility of Unlimited Free calls between 09:00pm to 07:00am to any network in India. The above plans will be implemented with effect from 15th February, 2016 onwards as promotional basis for a period of 90 days.